Sometimes using bleach on plastic can result in yellow stains. If this has happened to your bathtub it can be difficult if not impossible to remove the stains. 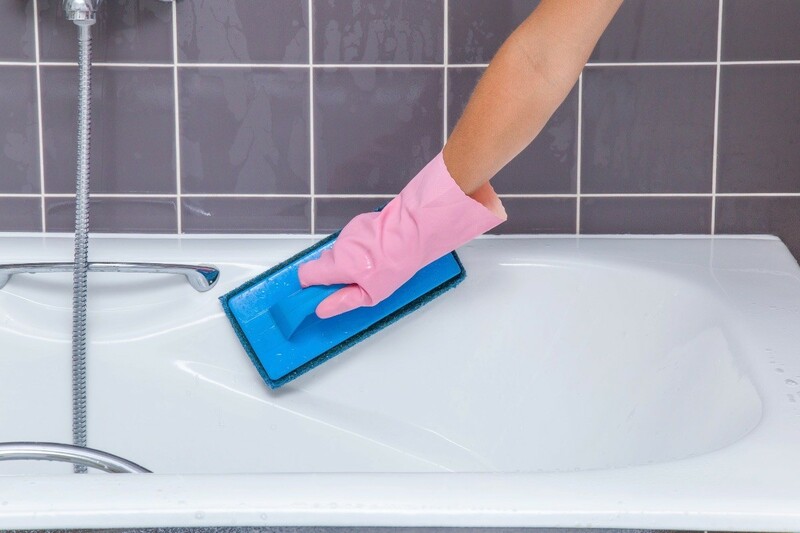 This is a guide about removing yellow bleach stains in a plastic bathtub. Question: Plastic tub in mobile home has yellowed? Can anyone tell me what in the world will make these plastic tubs in a newer mobile home white again? We bought this one after it sat empty 2 years and I have tried everything, even clorox to get these tubs white! I would appreciate any suggestions. We live in Louisiana and also have a mobile home. We tried everything to get the tub and dishwasher clean and the only thing that we found that works wonders we got from the dollar store. It comes in a green plastic container that holds about a quart. It has a sort of flip top opening. It's called "The Works". We also use it to clean the outside pump sand filter container. It seems that anything that the water comes in contact with turns brown eventually. So check out the dollar store for the Works as it cost only a dollar and it will work real well for you. By the way, don't scrub the tub, just put it on and let it drip down the sides. Use a sponge to spead it around and then sit back and let it work. Be sure to rinse it all off good before using the tub. We also put it in a spray bottle and spray the shower when we are done showering. I would try Westly's Wheel White .. you'd find it in the automotive cleaners section, it's meant to be a cleaner for whitewall tires but works very well on most any porous surface. We bought a lakeside home with the plastic decking that was very yellow and stained from sap and the WheelWhite cleaned it beautifully! As for a more natural cure .. a baking soda or borax paste might work as well .. it just depends on how severe the yellowing is. Once you get it clean again I would use a car wax paste like Turtle Wax to seal the tub and prevent the yellowing from happening again. Just be careful on the bottom so there aren't any slips! rims on your car, aluminum siding on your house. Anything at all. Years ago my son introduced me to this product and I have been hooked ever since. I have recomenned to others so very many times. I also use it on my patio furniture too. The uses are endless. Good Luck. I use Mr.Clean Magic Eraser.It cleans my tub,even cleans permanant marker off walls.and is really cheap. My mom moved into a new house and the plastic tub to her dishwasher was so stained and yellow. A repair man told her to use TANG- the orange powdered flavored drink. She was sceptical-but it worked! I don't even know how I stumbled on this post about a stained mobile home bathtub but very glad I did. Our plastic-like bathtub was seriously stained red when our well started pulling rust. We had to drill a new well, but nothing would even budge the red stains, as they seemed to have become one with the plastic. Then I read the post about using Castrol Super Clean in the Purple gallon jug at Walmart. The bottle didn't say "Castrol" but it was purple and called "Super Clean" so I bought it. The tub is clean for the first time in 9 years. I had used every cleanser, harsh chemical, and abrasive (including Magic Eraser and pumice stone) and nothing even so much as lightened the stains. I even filled the tub with straight bleach and used Iron Out (provided by our water company) with no visible results. I can't even imagine what else Super Clean can tackle, but it's made a believer out of me. I have a plastic (acrylic?) whirlpool tub that has yellow stains. I have a skylight over it that I thinks adds to the problem. I used "splashless" bleach to run the tub and clean the jets, which produced a lot of suds, these caused the yellow stains. I have tried several bathroom cleaning products, even Soft Scrub with bleach, but nothing seems to help. Have you tried vinegar, it cleans lot of stuff, good luck. I've used the liquid toilet bowl cleaner on a badly stained bath tub. I scrubbed it in with a broom and then left overnight. It came out good as new when nothing else would help.